Audio Control makes the use of your computer's audio simpler. "When you see things like Audio Control 4, you definitely know: it's just Better than you had before." Audio Control is Windows 10 compatible and certified software, as well as Windows 8.1, 8, 7, Vista and XP. See the Audio Control compatibility seals. 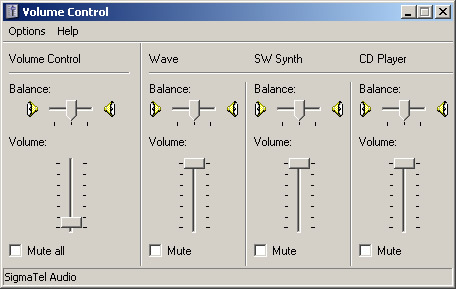 Audio Control is audio mixer software. It has an ergonomic design and extended functionality, which includes: saving space in the work area of the screen and on the taskbar, easy access, improved precision, intuitive interface, various work mode and idling features and much more. 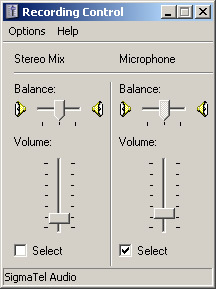 Audio Control helps by making the computer sound system easier to manipulate than the standard Windows Volume Control. Audio Control is a replacement for the standard system Volume Control. Standard Windows Volume Control Audio Control is designed with ergonomics and convenience in mind. For example, as seen on the image above, its fader (volume) controls are positioned horizontally, meaning the user need only turn (rotate) his/her wrist to alter the volume. In difference, the standard Windows Volume Control requires the user to lift and move their entire hand. Further, Audio Control displays all available devices, lines and controls in a very easy to access manner, and does not require the users to chase the controls behind menus and secondary windows. Moreover, Audio Control offers a number of different view modes, operation modes and other useful customizations and conveniences. All view modes allow vertical resizing, selection and view window for optimal performance and convenience. using the Left and Right arrow keys, Up, Down, Home, Page Up, Page Down and End keys. Audio Control can work in two operation modes, Fixed and Agile, and in sub-modes with idle user status. In Fixed operation mode Audio Control behaves as a typical application, remaining visible until closed. This is the default operation mode. The Agile operation mode allows direct use of the window behind Audio Control even when Audio Control is On Top. 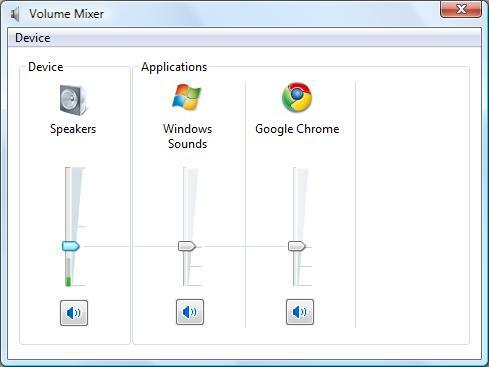 In this mode, Audio Control automatically disappears when the mouse is moved over it, allowing direct access to the window underneath, and reappears automatically as soon as the mouse is moved away. In the Agile operation mode Audio Control is always On Top and has no Taskbar button entry. Press and hold down the "Ctrl" key to make Audio Control stay in place when it is in Agile operation mode. 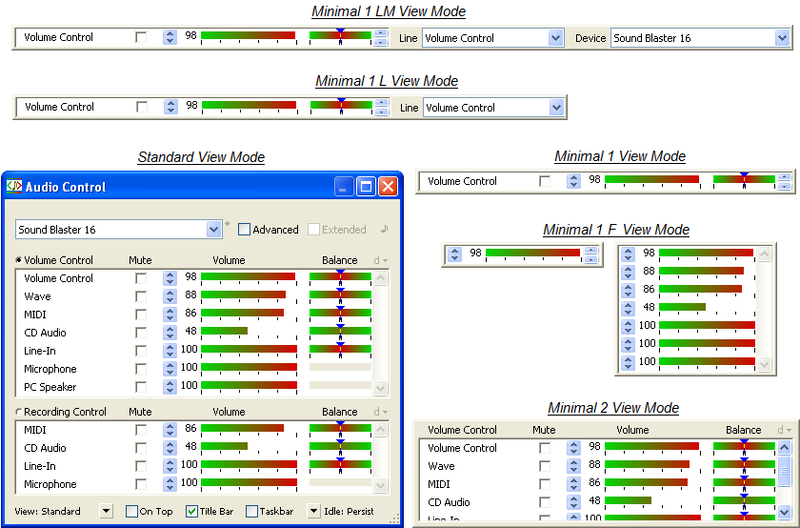 The Agile operation mode is particularly useful when Audio Control is in one of the Minimal view modes, On Top, and is placed over less significant but still used parts of other windows, as shown in the example below. This feature is particularly useful when watching films or giving PowerPoint presentations. When selected, Audio Control hides itself automatically a few moments after the user input becomes idle. Once the user input resumes, Audio Control reappears automatically. The Standard and Minimal 2 view modes have indicators displaying the idling state before the window disappears. Standard view mode time indicator. Minimal 2 view mode time indicator. The Fade mode makes Audio Control disappear smoothly when there is no user input. Five seconds after the user input becomes idle, Audio Control begins a transition to transparency which takes approximately 1.5 seconds. Audio Control remains invisible until user input resumes, thus allowing an unobstructed view of the area where it is positioned. This is the ideal audio volume control solution for watching videos on a PC and other similar applications. Audio Control disappears instantly five seconds after the user input becomes idle. Audio Control appears after user input resumes. Audio Control supports volume control adjustment via all possible inputs, such as: mouse, mouse wheel, clicking on the up and down arrows, entering a numeric value on the keyboard, hitting the keyboard arrows, Page Up and Down keys, Home and End keys, etc. There are many more advantages that Audio Control offers, including size, position, accessibility, logic, etc. Audio Control is easily customizable, allowing the user to set their preference for almost every property of the application. 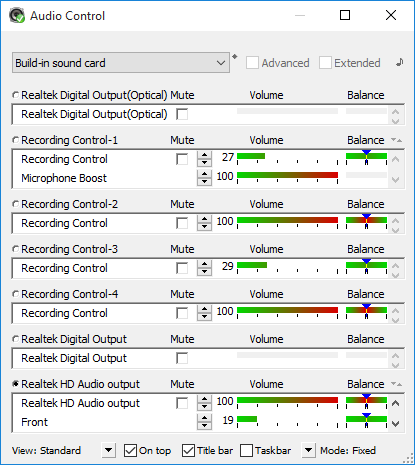 Audio Control displays all audio lines of an audio device in a single window and allows appropriate sizing of the window. Then the user can easily reach the precise control that they wish to adjust. Audio Control is also able to sort the controls by use, alphabetically, value and other properties. Technical features and applied methodologies that ensure robustness without taking up many system resources. © Copyright 2019 MBBSoftware. All Rights Reserved. Please type the anti-bot text below. Thank you for subscribing to the MBBSoftware newsletter.